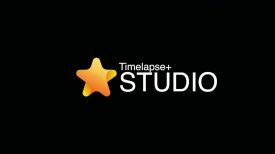 At NAB 2019 we were approached by cinematographer Ian Kerr CSC who asked us if we were interested in looking at something he has been working on. Of course we said yes. My initial reaction of what Ian showed us was one of genuine shock. 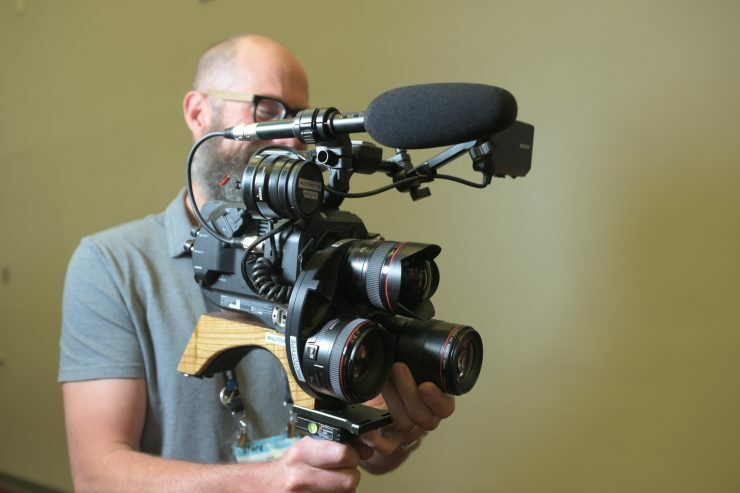 Here was a turret lens system mounted on a Sony FS7. That initial shock gave way to a genuine interest in the Multi Turret. Switch quickly between lenses (prime or lightweight zoom) without an assistant, lens case or incurring the wrath of a director who won’t wait for a conventional lens change. Select from multiple focal lengths while still using primes and the depth of field/ low-light capabilities they provide. Select from a wider range of field of views (and speeds) than any zoom can provide. An example would be mounting 14mm, 35mm and 135mm high speed lenses. The length , weight and centre of gravity of the system is reduced compared to larger ratio zoom lenses. Great for shooting in cars or handheld. 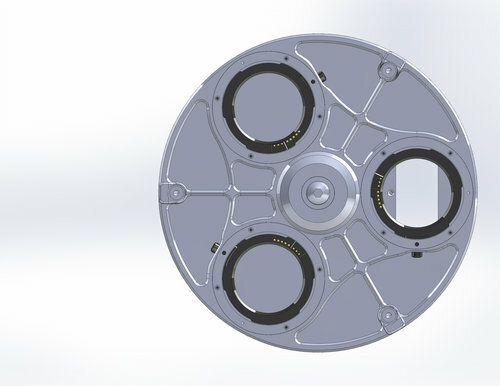 The Multi Turret allows for the conversion of lens mount types and camera mount types. For example, you could mount a PL mount lens, and EF lens and an F mount lenses on the same turret and switch rapidly between them. Love that unique visual “swing” effect that occurs when you switch between lenses. Customize your lens package for the scene you’re shooting. Wildlife at night? All long primes! In-car work? A short zoom, a 20mm and a 35mm or whatever you prefer. Throw a Swing/ Tilt or Lens Baby in the mix! Finally, it looks cool. Really. 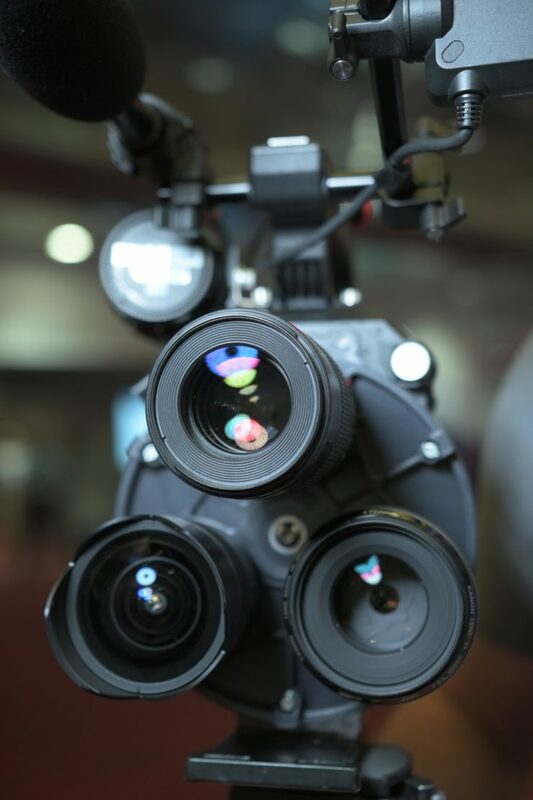 : a device that can be rotated to allow the user of a photographic or television camera his choice of two or more lenses of different focal length. The Multi Turret isn’t as silly as it sounds. If you want your theoretical 16-200mm full frame F2.8 lens you can have it by simply rotating between three lenses. This turret began as an exasperated joke. A frustrated, hands-thrown-up-in-the-air reply to the problem I’ve encountered again and again since verite documentaries began to shoot on larger (S35) sensors: I can’t get a wide shot and then, a moment later, a close-up. “I need a bloody lens turret!” I’d mutter to my AC as we juggled lenses back and forth in an attempt to cover a scene. I my mind we transported back to the 1940s shooting on a Eyemo ready to storm a beach. Or more likely, two poor film school students in the 70s with a hand-cranked bolex. 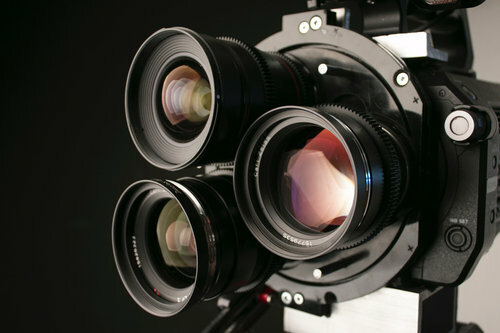 Both these cameras had lens “turrets”- spinning discs that allowed multiple lenses to be mounted and changed with a flick of the wrist. Zoom lenses largely killed the need for these turrets and they haven’t been seen for a long time in the professional world. I started my career as a documentary cameraman in the 90s using Betacams and, if I was really lucky, a little 16mm. While these formats lacked many of the qualities of 35mm, they did have one advantage: the optical physics behind smaller sensor/ film targets allowed for healthy zoom lens ratios in a portable package. “What?” many a Producer has asked after I spit out this jargon. “..the hell is a zoom ratio?” A zoom ratio is a measurement of the ability of a zoom lens to capture images from a range of focal lengths or perspectives. A 10-100mm (10mm wide to 100mm telephoto) would have a 10:1 ratio, while a 10-20mm lens would have a 2:1 ratio. The greater the ratio, the greater the operator’s ability to change instantly between a wider angle and longer telephoto shot. In documentary and other fast-moving/ reactive genres (sports, reality, events), your lens ratio can make or break you. It will mean the difference between snapping back and capturing a key unexpected moment in a wide shot or failing to capture the scene’s context because the moment is lost in a telephoto-framed shot. It will determine whether a single, skilled operator will cover an entire handheld scene or if you’ll need two operators to provide the range of perspectives that one high-ratio lens could. In my documentary days I’d generally travel with two zooms: An 11:1 “wide” zoom and a 21:1 “standard” zoom. With these two lenses I could cover any scene between a conversation in a car or bathroom, to a nature shot of a largish animal in the wilderness. Switching between lenses took about 20 seconds (maybe 40 if wearing gloves) but I often spent an entire day on one lens- using it not as a “zoom” but as a “variable-prime” and taking advantage of the multiple perspectives it could offer without switching lenses. “Go Long, Go Wide, then Go Home” was the mantra. Much of my early work was small crew- just a sound recordist and I. Like many other doc shooters, I prided myself on my ability to cover a conversation with a single camera, listening to the cadence and information within the discussion so as to be on the right face at the right time, pulling away to a group-shot when necessary. When 35mm sensors arrived I was in heaven. Like so many of my colleagues, I loved the thin depth of field and range of glass available. My first verite shoots were another story. A nightmare! Physics dictates that the zoom lenses that I had always relied simply don’t exist in the 35mm world. An Optimo 24-290mm (12:1) weighs 24 pounds (!) and gave me half the reach of my old 21:1. Oh, it also cost twice what the 21x lens did and forget using it handheld. To this day there’s no wide-angle S35 zoom with a range and speed even close to my workhorse 11×4.7. I eventually found ways to speed up lens changes but this required working with a dedicated AC which wasn’t always possible. I watched fantastic things unfold as I fumbled changing lenses- those shots haunt me to this day. I tried B4 to S35 mount adapters to get back to the ‘ol days but they were disappointing. I settled for the Canon 17-120 but it never seemed long or wide enough and directors (or I) often wanted a ultra-thin depth-of-field or we were working in low-light and the zoom was too slow for either purpose. Out of desperation I began to experiment with not switching lenses but switching camera bodies, one with a wide prime lens, the other with a long lens. This style of work was similar to that of photo-journalists but it meant carrying TWO built cameras at a time. To be effective, the camera form-factor had to be small and light (e.g. A7s) which were not ideal doc cameras. I didn’t realize the extent of my frustration until I did a last-minute shoot with an old Sony F800 and my dusty 11×4.7 lens. The EVF was black and white, the camera chunky and it wasn’t great in low-light, but the experience was a revelation. The gear got out of my way and I could just follow story like I did in the old days. It was so easy that it made me want to weep. Then it made me mad. So I decided to reach back in time and build something from the pre-zoom lens days: a re-imagined lens turret with a twist. By using the flange focal length difference between a traditional camera lenses and those of mirror-less digital cameras, I could eke out enough space to do lens and camera adaptions and perhaps jam a filter in there. I’ve put a lot of thought into this and worked with some great people to get the design to a good place. Please let me know what you think or if you have any questions or suggestions on how to make it better. I hope to have these out in the world and making lives easier very soon. ARE ELECTRONIC CONTROL AND COMMUNICATION WITH THE LENSES POSSIBLE WHEN MOUNTED ON THE MULTI TURRET? The latest prototype allows for full communication and control of EF mount lenses via Sony FS7 and A7S/R cameras and we’ll be testing Venice soon. Ian expects that wil also be able to convey metadata from PL lenses etc. via the Multi Turret. WHAT CAMERAS WILL THE MULTI TURRET WORK WITH? 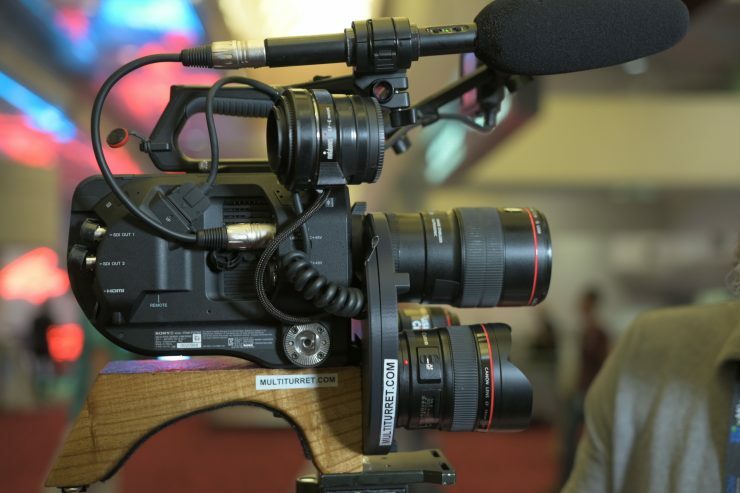 The prototypes have been designed to work with Sony FS7Mk2, A7S/R, Venice, and other Alpha-mount cameras. They expect to extend support to Arri and Red shortly. WHAT LENSES WILL THE MULTI TURRET WORK WITH? 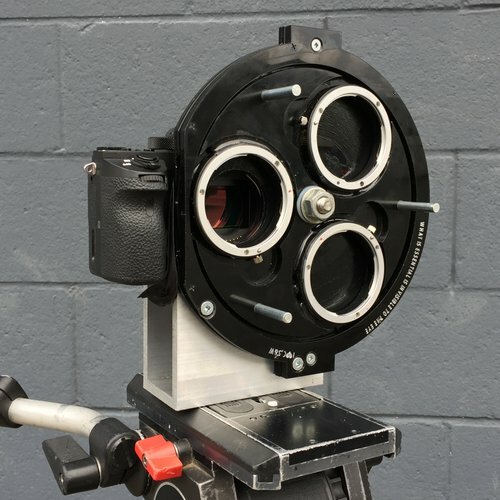 The prototype has been designed to work with select EF mount lenses (including the electronic control of focus, aperture, etc) but PL , F , K and other mounts are likely also possible. HOW ARE THE EF LENSES CONTROLLED? The prototype permits the installation of any Alpha-EF mount adapter (eg. Metabones) to achieve the Alpha-EF protocol conversions. No modification to the adapter, camera or turret is required. HOW QUICKLY CAN THE MULTI TURRET BE INSTALLED AND REMOVED? 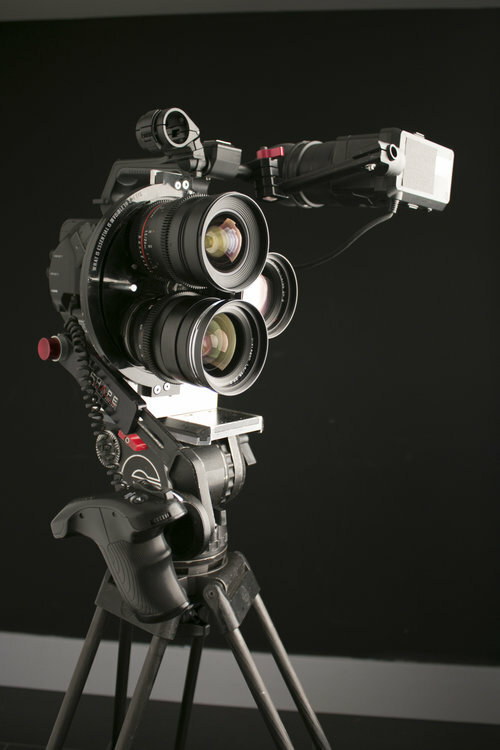 The prototype turret is installed on Alpha-mount cameras (Venice, Fs7Mk2, A7S/R) via the camera body lens mount and an additional bracket, with 1-2 bolts to support the weight of the system. The overall system will be designed to be installed or removed within 45 seconds. Multi Turret is looking at including the ability to add optical filters or auxiliary optics between the mounted lenses and the camera body. A7s/r users would love this. Right now they also looking for feedback so please let us know what you like/ hate. Let us know in the comments section below.